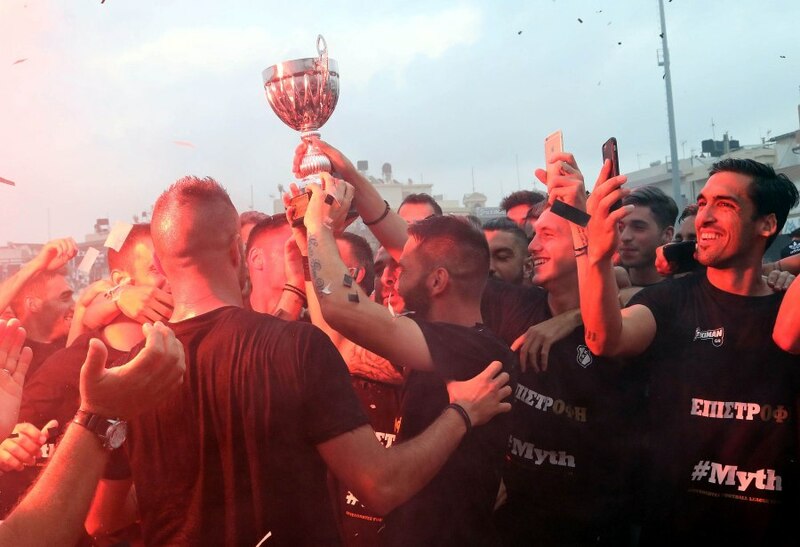 OFI emphatically defeated Sparti 5:0 on Sunday and were crowned champions of the 2017/18 Greek Football League. Despite the loss, Sparti were salvaged thanks to a late Aris goal against Anagennisi Karditsas. OFI made a triumphant return to the Greek SuperLeague after being crowned champions of the second division on Sunday. The Cretan outfit defeated Sparti with an empathic 5:0 scoreline to finish top of the Football League table, one point ahead of second placed Aris. Scenes of join followed the final whistle in Irakleio, marking an end to OFI’s two year absence from the SuperLeague. On the other hand, Sparti were lucky to avoid relegation after their 5:0 defeat. The Lakonia side were bound for the third division as Anagennisi Karditsas (also fighting to avoid the drop) and Aris were on their way to a goalless draw. However, Aris came away with a late, dramatic victory thanks to Lottas’ penalty goal in second half stoppage time, sending Anagennisi Karditsas to the Gamma Ethniki and keeping Sparti in the Football League. The Football League’s leading scorer, Manos, put OFI ahead 2:0 in the first half with goals in the 11th and 25th minutes. Koutsianikoulis added a third in the 64th minute before Manos completed his hat-trick in the 68th minute. Papasterianios netted OFI’s 5th goal of the night just two minutes later, capping off a great performance from the hosts in front of their passionate supporters. The OFI players dedicated the 2017/18 Greek Football League title to OFI legend and former coach, Eugène Gerards, who passed away earlier this earlier this year.